Hello! Life has been pretty busy so please pardon my absence from this blog. I love doing this blog and I hate being away. So for a holiday treat, I have a post from a local winery I went to in October. My friend Emily arranged it and actually paid my way which was so sweet. Thank you Emily! Cheers to you. The winery in question is the Great Shoals Winery in Maryland. If you are in the DMV area, I highly recommend it. Great Shoals Winery was founded in approximately 2010 and uses local ingredients for their ciders, wines, and sparkling wines. They’ve won a few awards too. Our tasting included cheese, crackers, and a selection of wines and ciders. The hard pear cider had a strong honey flavor and was slightly carbonated. It was very dry as well as very delicious. The chambourcin is a medium body red which would be an ideal table wine. Like many wines in the area, Chambourcin was tweaked by Jefferson in Monticello. Another table wine which is delightfully fruity. It is composed of vidal and Chardonnay. It is very refreshing. While fire may denote spice, it is actually a sweet wine with a slight tartness. The Bay Fire is a lovely caramel color. The ginger hard apple cider is very ginger forward. I am not talking about Angry Orchard Ginger, but a real ginger cider (no disrespect to Angry Orchard, but this stuff was real). Hard Cherry won the governor’s competition. It is very subtle and not overly sweet. I really enjoyed this but I always enjoy anything with cherry. The spiced apple was delicious and warm. It is made with cinnamon orange peel and clove so it tasted like pure fall. I loved this tasting and I hope if you live in the area you can come check out Great Shoals! 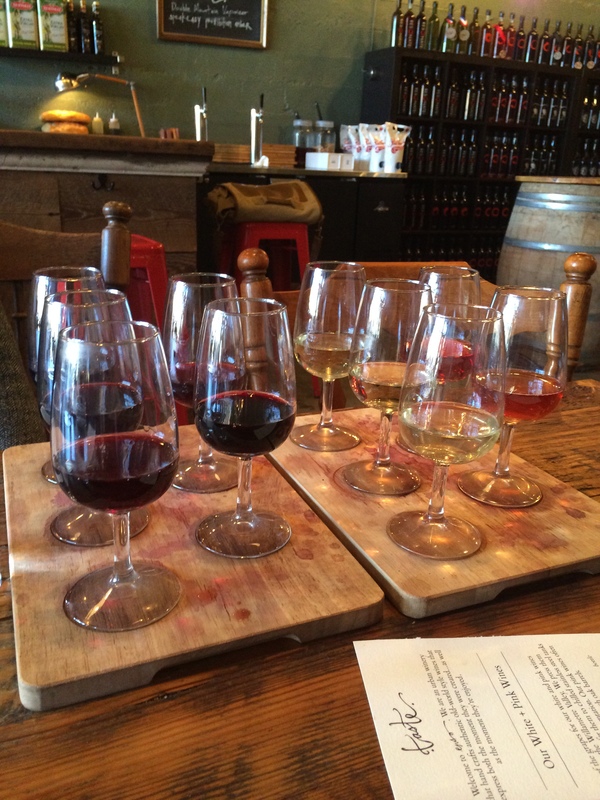 Posted in Uncategorized, Wine Tasting and tagged cider, drink local, Great Shoals Winery, local wines, maryland, maryland wines, rosé, wine tasting. Bookmark the permalink. Ok this is my last vacation post! I can’t ride on the coattails of vacation forever and besides, I need to get back to pairing. 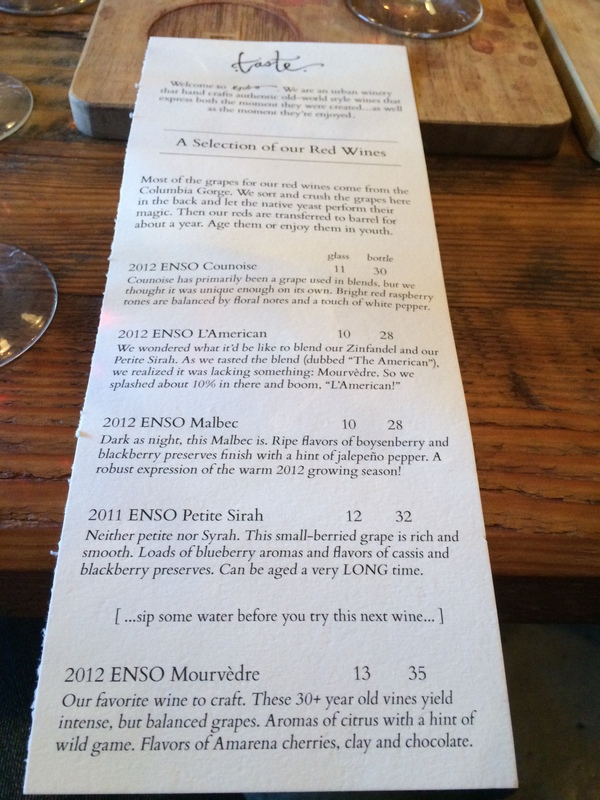 Today I am sharing a few pictures from our trip to Enso Urban Winery, a hip little spot in Portland. Apparently it is critically acclaimed as well! Unfortunately I didn’t take any notes but I can say with confidence that you should check them out if you are in the area and enjoy some quality wine. A very impressive menu with some interesting flavor notes. I hope you are enjoying a beautiful spring. I plan to have another post up ASAP! 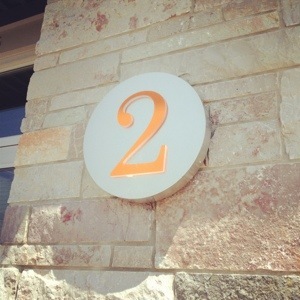 Posted in Uncategorized and tagged Enso Urban Winery, Sommelier, wine tasting. Bookmark the permalink. All, it has been awhile since a real post but you may have heard of a little storm called derecho. We made out better than most, but it threw me off my schedule. The storm compounded by post-vacation workload left me exhausted. I also had my mom and a friend visiting so I was busy with other pursuits. But I have time now and I possibly will pair this evening! Please stay tuned. 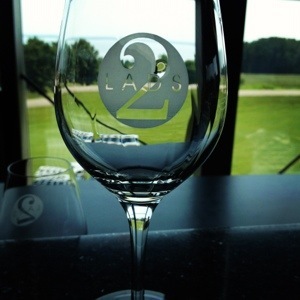 For now, I want to share with you my visit to 2 Lads Winery in Michigan during my vacation. The winery itself is physically stunning. 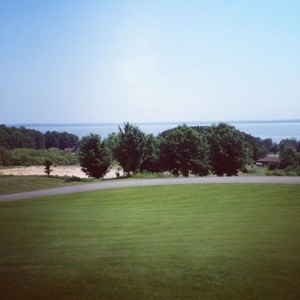 Located on the shore of Lake Michigan, the winery looks out onto the beautiful body of water. The building is more modern, with huge glass windows and stark decorations. The wine list is expertly planned, starting with a crisp, sweet and almost buttery pinot grigio. It lingers on the tongue like silk. This was the most remarkable wine on the list and in hind sight I should have bought the bottle. Or you know 10 bottles. Not to be outdone, their Pinot noir crashes onto your pallet. It’s pungent with hints of raspberry and blackberry. The richness demands tiny but purposeful sips. It’s a delightful wine because you can really savor it. At under $30, it’s a great buy. If you are in the area, I recommend this winery. I hope to go back there for a full tour. So stick with me kids, and you can see the world, glass in hand. Posted in Wine Tasting and tagged 2 lads, Michigan, wine tasting, winery. Bookmark the permalink.